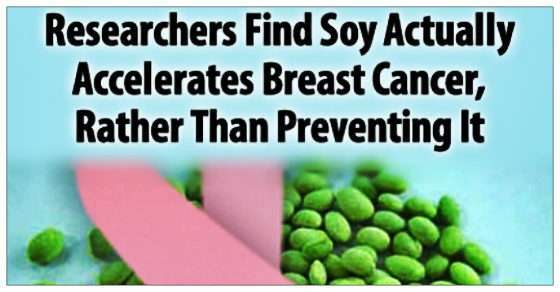 Previous reports by several scientists in both reputable publications and cancer foundations have stressed the importance of soy to reduce breast cancer. Meanwhile there has been plenty of research to contradict these claims and completely oppose them. Researchers at the Memorial Sloan Kettering Cancer Center in New York studying invasive breast cancer are warning women that adding soy to your diet will speed up the rate at which breast cancer cells spread. The Chinese did not eat unfermented soybeans as they did other legumes such as lentils because the soybean contains large quantities of natural toxins or “antinutrients”. First among them are potent enzyme inhibitors that block the action of trypsin and other enzymes needed for protein digestion. Researchers at the Memorial Sloan Kettering Cancer Center compared tumor tissues from before and after a 30-day regimen of consuming a soy supplement while a control group took a placebo. They found changes in the expressions of certain genes, that are known to promote cell growth, in those women taking the soy supplement. All those taking part in this study had recently had breast biopsies and were diagnosed with stage one or two breast cancer. They were all scheduled to have a mastectomy or lumpectomy two to three weeks later.The researchers said it is not yet clear if the effects can be reversed. Of the women with high genistein levels, a few of them experienced changes in a specified set of genes that are known to affect breast cancer cell growth, death, or some aspect of breast cancer pathology, Dr. Jacqueline Bromberg, co-author of the study said. The researchers concluded those who eat soy regularly could ‘reasonably consume that amount’ through the course of a day, particularly vegetarians and those who do not eat dairy products. They warned those living in Asian countries could be especially at risk, due to the high levels of tofu and soy in traditional diets. Dr Bromberg, said: ‘We’re not talking about 20 times more soy. A 1998 survey found that the average daily amount of soy protein consumed in Japan was about eight grams for men and seven for women – less than two teaspoons. Americans are consuming amounts far exceeding this quantity. Any ingredient listed as soybean or soy on any product ingredient list has a 93% chance of being GMO if it is not listed as organic. But even organic soy cannot be trusted. Soy is very problematic crop. Non-organic sources of soy in many agricultural practices are being passed off as organic. In 2011, the USDA uncovered a plot to import fraudulent organic certificates produced by an uncertified supplier in China. The Chinese firm used the counterfeit certificate to represent non-organic crops, including soybeans, millet and buckwheat, as certified organic. These types of things are happening every year and only a fraction are being discovered. Even domestically sourced organic soybean crops are now being investigated for having GMO origins. Organic soy also does not change the toxicity of unfermented sources so abundant in the food supply. Phytates in unfermented soy products actually obstruct absorption of protein and four key minerals: calcium, magnesium, iron, and zinc better than fermented sources. In their natural form, soybeans contain phytochemicals with toxic effects on the human body. The three major anti-nutrients are phytates, enzyme inhibitors and goitrogens. These anti-nutrients are the way nature protects the soybean plant so that it can live long enough to effectively reproduce. They function as the immune system of the plant, offering protection from the radiation of the sun, and from invasion by bacteria, viruses, or fungi. They make the soybean plant unappetizing to foraging animals. All plants have some anti-nutrient properties, but the soybean plant is especially rich in these chemicals. If they are not removed by extensive preparation such as fermentation or soaking, soybeans are one of the worst foods a person can eat. The net protein utilization of unfermented soy is 61 which quite low. The most common soy (99%) sold at major grocery retailers in soy milks and processed foods is unfermented soy. It is deadly. Fermented sources of soy such as natto, miso, tempeh and some fermented tofus are likely the only types of soy that should be consumed by humans and that’s only if you can get around the crap shoot that they’re non-GMO and organic (which there is no guarantee despite labeling). When food is eaten, digestive enzymes such as amylase lipase and protease are secreted into the digestive tract to help break it down and free nutrients for assimilation into the body. The high content of enzyme inhibitors such as trypsin in unfermented soybeans interferes with this process and makes carbohydrates and proteins from soybeans impossible to completely digest.